Rowan’s brand manager, Kate Butler, says in a video about the project that the aim was to get more people knitting in “the Kaffe way,” which isn’t difficult knitting, just a lot of color. The projects involve multicolored squares, and you can choose to make an afghan, a small cushion, an oblong cushion or all three. Four colorways have been selected by Fassett for the project. Each one uses 10 different colors, and you can download the shopping list now (it’s a PDF) if you’re interested in the project. 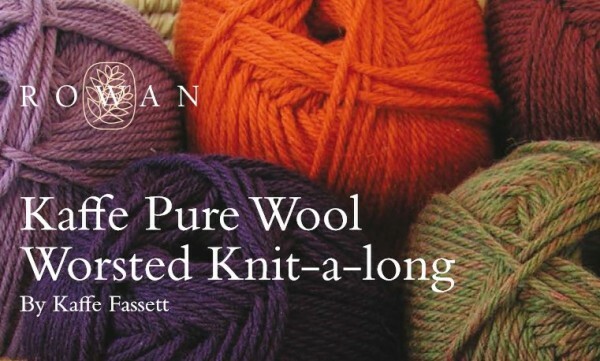 It uses Rowan Pure Wool Worsted, which is machine washable and worsted weight, so whatever it is you’re making will be colorful, durable and get a lot of use for years to come. The project will run through Dec. 19 and includes instructional videos by Fassett and designer Sarah Hatton. If you decide to take part, I’d love to hear about it! Oh wow! Another knit along! Maybe. I will check it out!